Dog Ear Publishing releases “JFK: 4 Out of 3” by Stephen Ladds. A young psychiatrist challenges a patient known only as Sherlock Holmes to solve the mystery of the assassination of President Kennedy in this new book released by Dog Ear Publishing. His theories provide new insights into this modern-day mystery. A dark and rainy night brings a wheelchair-bound man who refuses to speak to authorities to the Baker Clinic, a former orphanage that now serves those with mental impairments. In this new book, the young psychiatrist caring for the patient, known only as Sherlock Holmes, challenges him to resolve the mysteries of the assassination of John F. Kennedy. Was the assassination the result of a conspiracy or the work of a single gunman? Set in 1989, this blend of fact and fiction includes humor and even romance as Holmes provides new deductions related to the historic event that changed a nation. “JFK: 4 Out of 3” questions the Warren Commission’s report, which concluded Lee Harvey Oswald was the lone gunman, firing three shots: one hit the president’s head, another missed and the third struck both the president and Gov. Connally – a hotly debated conclusion. Abraham Zapruder, a bystander, captured the event with his 8mm home movie camera, and it’s this film and other material that Holmes studies as he attempts to determine what really happened that fateful day. As Holmes begins to deduce new aspects of the assassination, the young psychiatrist grows closer to him and to his bewitching secretary. Will the greatest detective of the 19th century be able to solve the greatest mystery of the 20th century or is he nothing more than another mental patient? Author Stephen Ladds, who was 6 at the time of the assassination Nov. 22, 1963, became interested in the assassination of John F. Kennedy in high school when a friend showed him a book by Josiah Thompson, “Six Seconds in Dallas,” offering theories on multiple gunmen. 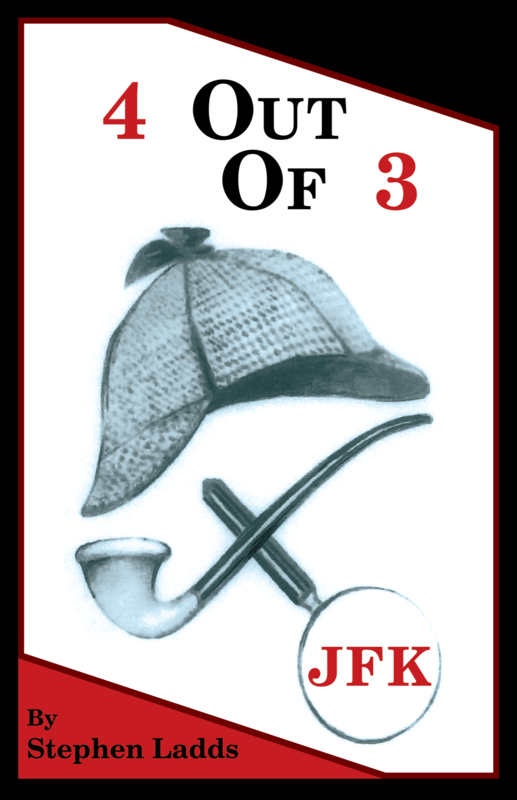 Years later, after reading a story by Sir Arthur Conan Doyle about his amazing detective Sherlock Holmes and coincidentally viewing a documentary by Nigel Turner, “The Men Who Killed Kennedy,” Ladds writes that he decided to explore what might happen if Sherlock Holmes turned his brilliant mind to the case. This book, more than two decades in the making, is the result. For additional information, please visit www.JFK4OutOf3.com.